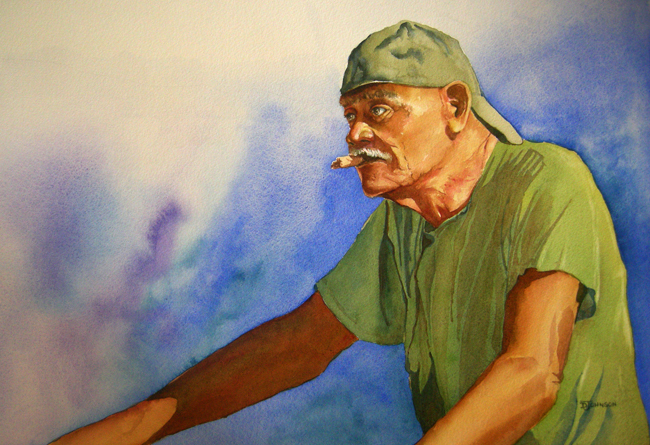 This is a watercolor, 26 by 20 inches, of a man I saw fishing here on the coast of the Atlantic Ocean. I loved creating his skin tones and building in the character of his wrinkled face. This piece was created with several layers of pigment building up the darker, shadow areas. The background is a wet-in-wet wash of French Ultramarine Blue and Permanent Alizarin Crimson. This piece is for sale on my etsy shop, if you are interested. Hope you enjoy it. It really was fun to paint.